For such a large instrument, the acoustic piano can be surprisingly delicate! Pianos require frequent care and maintenance to remain happy and healthy. If your instrument is experiencing problems or is not playing as well as it used to, we are here to help! This article includes a short list of common piano maladies and ways that they can be quickly addressed. Most importantly, it includes tips on how to extend the life of your piano and prevent possible issues in the future. As always, our experienced Songbirds Music, Art, & Dance Center staff is here to help you and your piano! The most common and frequent issue with pianos is that they go out of tune. Fortunately, reliable tuning technique has been around for as long as pianos have! Did you know that the average piano has around eighteen tons of pressure that is constantly exerted on the strings? That’s crazy! With so much force and pull, it’s not wonder the tuning has a tendency to slip over time. If your instrument sounds funny, some notes sound “sour” or poor, you hear excessive beats (vibrations in resonance when two or more notes are struck together), or you can’t remember the last time your instrument was tuned, it’s definitely time for a tuning session. We recommend that your piano receives proper tuning once every six months. If the piano is old or hasn’t been taken care of for some time, it may need extra tuning sessions until the strings get used to the appropriate tension again. Oftentimes, pianos that have been neglected for years dramatically shift in pitch. In these cases, it isn’t uncommon to find instruments that are a whole step (one white key) flat! A piano tuner will have to slowly wind the strings tighter and bring the piano up to standard concert pitch over several visits. Fortunately, piano tuning is a relatively easy process for an experienced tuner. A standard piano takes between one and two hours to tune and costs anywhere between $60 and $150 depending on the technician. Please be advised that you should not attempt to tune your piano under any circumstances. Piano tuning is a tedious process that often requires years of training, patience, finesse, and a very good ear. If you do attempt to tune on your own, you may risk breaking piano strings or harming the integrity of your instrument’s tuning pegs and soundboard. While having a piano tuner come to your house may seem like a vexatious cost, it is completely worth it for your instrument. Having frequent and proper tuning ensures that your instrument will have a long and happy life. Your piano will thank you! Piano action refers to the weight and feel of the keys as you play. If your instrument requires excessive force to make the notes sound, the keys drop too quickly and easily, some notes are easier to play than others, you can visibly see changes in key depth, or your fingers and wrists get too tired while playing, it is definitely time for an action adjustment. This process is also referred to as regulation. Luckily, action adjustments are usually simple and do not take a piano technician long to complete. Key leveling, or fixing variations in key depth, is a more lengthy process, however. Please be aware that, although action adjustments are not complex, they require special tools to complete correctly. It is strongly advised to hire an appropriate piano technician in order to adjust your piano’s action. A piano key is considered “dead” when it does not make a sound when struck. This is a common occurrence with pianos both new and old, especially in Florida. The usual culprit for our climate is humidity. Many modern pianos have dehumidifiers built in to the cabinet. If your piano has one, be sure to leave it plugged in at all times. If not, appropriate piano dehumidifiers are available online for reasonable prices. Sometimes, fixing the humidity problem requires some extra work that you can do on your own. When excessive moisture is present in the air, it often gets into the felt strips and pieces on the piano and causes them to swell. If the piano key in question does not rise quickly after it is depressed or only makes a sound when hit with excessive force, the extra moisture is likely in the felt pieces that are located around the key pins. In this case, carefully depress the neighboring keys and firmly grasp the key in question. Move the key side to side with slow, firm pressure and depress the key several times. If the key moves more freely and strikes as it should after performing this technique, moisture is definitely the problem. You can repeat this method for any key, although the problem may occur if the environment regains moisture or extra humidity. In extreme cases, you can dry out the felt by applying a hair dryer to the key on low heat for approximately ten seconds at a time. Please be very careful to not melt your piano keys, though! Alternate the hair dryer technique with the above pressure technique should allow the key to return to normal operation. If the key moves freely and returns to its correct height without problem but still does not sound, the issue may be with an internal part that has failed. A string might be broken, a piano hammer might be cracked or missing, or a foreign object might be resting against the string. If there is not a visible obstruction within the piano cabinet, a piano technician will need to examine the piano in order to determine the cause of the problem. String, hammer, and general internal reparations can be difficult and time-consuming and are best left to professional technicians. A piano key is considered “locked” when it does not move when pressed, it offers considerable resistance to pressure, or it feels jammed. Sometimes, a locked key may still produce a tone, although often with extreme difficulty. If a key on your piano is locked, it is not recommended for you to attempt to fix the problem. Oftentimes the key failure originates with the hammer mechanism which includes some of the most fragile pieces of the instrument. If one of those pieces breaks from improper handling or attempted reparation, it is often difficult and costly to get it replaced. If you are particularly lucky, a locked key may result from a foreign object, such as a pencil, resting against or wedged in the hammer mechanism. Carefully remove the object, and your key should be as good as new. A locked key is one of the more serious maladies on this list. Under no circumstances should you attempt to force the key to respond or move without the aid of a professional piano technician. Pianos can sometimes produce some weird and unusual noises when played. In fact, there is an entire sub-genre of musical compositions for “prepared piano”. These pieces focus on the amazing and funky sounds that can be manufactured by placing foreign objects such as rubber stoppers, pens, rulers, metal sheets, and more at strategic locations on the piano strings. You probably have guessed by now that the leading culprit for unwanted piano noise, rattle, or unusual sound is an object that has somehow fallen into the piano. This is a very easy fix. Simply open the piano cabinet, locate any items that don’t belong inside a piano, and carefully remove them. The use of a flashlight and tweezers to get into the nooks and crannies may be necessary. You’d be surprised what can be found, especially in second-hand, old pianos. My most interesting finds to date include money, a screwdriver, all kinds of writing utensils, sheet music, index cards, and a folding hair comb. If you have opened your piano, removed any foreign objects, and your instrument still produces rattle or an unusual noise, the problem may be more complex. In rare cases, cracks in the piano cabinet or soundboard produce rattle or unwanted hum when the instrument is played. Unfortunately, these issues are difficult to fix and require extra time and funds. 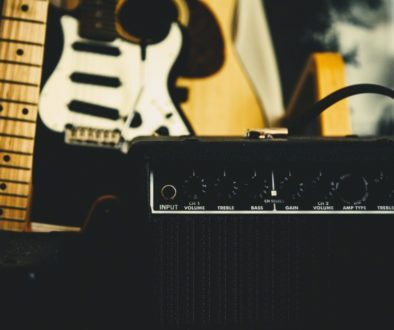 If you are certain that your instrument is in tip-top shape and is not cracked, hum can be produced by a nearby source of vibration in the room. Be sure that your piano is not resting against things that go shake in the night, including, but not limited to, space heaters, radiators, refrigerators, air conditioners, sound systems, televisions, and electrical outlets. Fortunately, rattle or foreign noise is the easiest piano problem to identify and fix! You can definitely do this on your own, and you might even find some lost treasures in the process! Sometimes, old pianos or instruments that have not been properly maintained develop an extra echo or reverberation that rings out after the key has been played. This sound can range from a short, quiet harmonic pitch to a full-out sustain as if the right pedal were depressed. Fixing this malady is rather involved and is best left to the hands of an experienced technician. 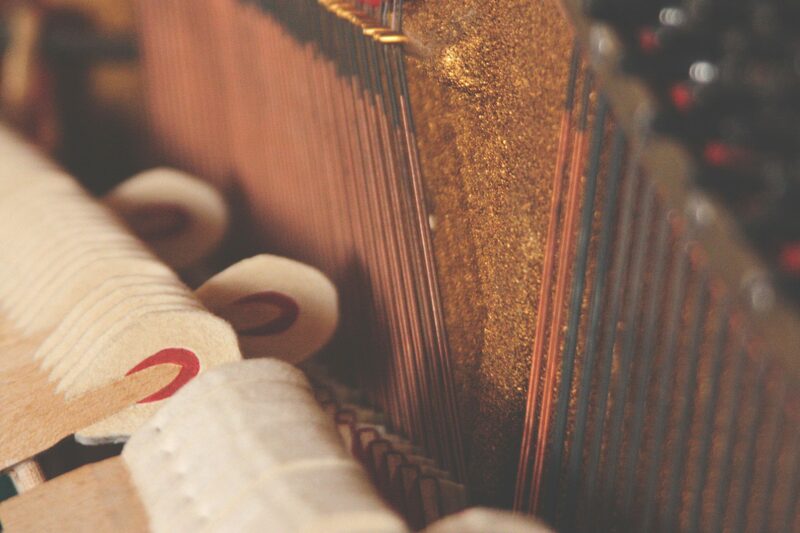 If your piano is experiencing this problem, open the cabinet and notice the small felt pads that contact the strings. When a key is struck, the pad in question should move away from the string and return to its resting position as soon as the key rises away from the key bed. You can also find the correct felt piece by watching what happens when you depress the pedal to the right. More often than not, this echo is caused by the felt not completely or firmly returning to its home against the string. This improper contact allows the string to still vibrate which produces the sound that is bothering you so much. The most common fixes for this issue involve the felts themselves and the right piano pedal. If your piano is old, the felt pieces may need to be replaced entirely. This process is not difficult, but is rather time consuming and usually requires the hammers to be removed from the piano. If the felts seem to be in good condition, the extra reverberation may be caused by a misaligned sustain pedal. Both of these fixes need to be completed by an experienced piano technician. If you piano has lost its musical shine or if it sounds a little too mellow for your taste, it may be time to adjust the hammer felts. Open the piano cabinet and locate the large wood and felt hammers that strike the piano strings. You’ll notice that many of the notes are actually produced by three identical strings that are tuned to the same pitch. In the lower registers, this number is reduced to two and then one string as the string gauges get larger. After many years of play, the felt on the hammers actually gets compressed and begins to form hardened grooves that match the shape of the steel strings. In order to breathe new life into the tone of your piano, you will need to have the old and hardened felt shaved down so that new and fluffy felt can strike the strings. An experienced piano technician can accomplish this rather quickly and with little effort. If you are particularly handy, you can attempt to try this on your own. Take a piece of medium-grit sandpaper and glue, staple, or tape it to a small piece of wood. A paint stick works well. Alternatively, you can use a flat, not rounded or circular, wood rasp or file. Take your instrument of choice and, very carefully, begin to shave the old felt away. Be absolutely certain to change the angle so that uneven bumps and patches do not appear. While completing this repair, you may wish to wear a face mask as the felt dust has a tendency to go everywhere. Please remember that a little bit goes a long way. Any felt that is removed can never be replaced, and if you shave too far, you risk compromising the entire hammer. Never shave far enough that the wood is exposed, and please remember that the goal is to make the hammer felt light and fluffy. A botched job will result in felt replacement, so please proceed with caution. We’ve all seen it: the piano with a slew of missing keys. This is particularly common with old pianos that have (or had) original ivories. Due to animal cruelty laws and regulations, ivory key tops are no longer legally produced. If you have a piano with original ivory, you can purchase imitation piano ivory that looks an feels exactly the same. Most modern pianos are made with hard and durable plastic key tops. Luckily, you can replace your own key tops in order to save yourself time and money. There are plenty of reputable piano part dealers online – please do not hesitate to ask what we use as we will happily point you in the right direction. Once the parts have been ordered and have arrived, you can quickly apply a strong specialty glue or adhesive to the empty key and replace the key top. Super glue is a quick alternative, although be careful not to get it on anything else! You may need to scrape old glue, ivory, or plastic remnants from the key before replacing its top. This can be done with any razor blade or sharp craft knife. As always, please be careful with blades and be sure to use strong adhesives in a well-ventilated area. If the idea of replacing key tops makes you nervous, any piano technician will be happy to replace them for you. If you have ivory keys and there are gouges, cracks, or scars on the key tops, you or a piano technician can easily repair them with imitation ivory repair kits. Is the key cover on your piano stuck in a certain position? Will it not close or open completely? No sweat! Luckily, this issue is very easy to fix. It is most commonly caused by, you guessed it, something lodged in the piano that doesn’t belong there. If you can’t see anything from the outside, or if you can but are not able to reach it, you will need to take the piano cabinet apart. Find a reliable screwdriver (most older pianos use straight ones, not phillips) and carefully remove any nearby screws. Be sure to draw yourself a diagram or place the screws in a pattern so that you can remember how to reinstall the cabinet pieces when the reparation has been made. For grand and baby grand pianos, there is usually a row of large screws under the keys that are only accessible from the floor. Once the cabinet has been dismantled and any foreign object has been removed, simply reinstall the screws and your piano should be as good as new. While you are at it, you may wish to check on the hinge mechanism that connects the key cover to the sides of the cabinet to make sure that it is clean and functioning properly. If you cannot discern what is causing the malfunction, you may wish to contact a professional piano technician. If a key or several keys on your piano are not striking the strings reliably, you may have a malady that requires the help of a piano technician. Each note should sound as quickly as you are able to repeatedly press it. If, when you quickly press one key several times, it “skips” the note and does not sound, you have a key striking issue. This problem is not incredibly common, but if it is occurring with your instrument, a piano technician will need to make a visit. There are several small internal parts with the hammer mechanism that can fail and cause a key striking issue. If you read through the above common piano maladies, you might have already realized that pianos respond very sensitively to their environment. A lot of tuning and regulation problems can be avoided by placing your instrument in an appropriate location in your home. Try to avoid areas that have excess humidity. Also, please place your piano where it can avoid any unnecessary bumps or motion. Acoustic pianos are happiest where they are able to rest in one spot for a very extended period of time. Most importantly, temperature fluctuation inside and outside your home has a massive effect on piano tuning and wellness. Drastic changes in weather, especially during winter, will certainly have an effect on your instrument as it will swell, expand, and contract with the seasons. There is nothing that you can do about nature, but you can ease the strain on your instrument by keeping it reasonably far away from heat sources and drafty areas. Try not to put you piano directly in the sun, under an air conditioning vent, or by a heater. Your instrument (and your checkbook) will thank you for not requiring excessive tuning sessions! As previously mentioned, a well-maintained piano requires tuning once every six months. This is extremely important – if the tuning is allowed to slip, it will be more costly and time consuming to bring the instrument back up to the correct pitch. It’s much better to be proactive than reactive. Please be aware that a piano should be tuned anytime that it is moved. While it may not seem serious at first, moving a piano puts undue strain on its internal parts, especially its soundboard and strings. It is always good to have a check-up after a move just to make sure that everything is in working order. If you play your piano frequently, you will need to have it regulated at some point. The frequency of regulation, or action adjustment, is unique for each instrument and musician. An experienced piano technician can help determine how often regulation is required for you and for your piano. For now, you should only need to have an action adjustment if you are experiencing a lack of dynamic contrast, uncomfortable resistance, or general unwanted response from your keys as mentioned above. Regulation should not occur frequently, but if you are unsure if you need it, please ask a piano technician for his or her advice. Please be sure to clean, dust, and sanitize your piano as frequently as other pieces of furniture in your house. Spiders and other creepy-crawlies have a nasty habit of hiding in pianos, so it’s always a good idea to keep them pristine. Be sure to use cleaners that are safe and will not damage the finish on your piano. For very old and antique pianos, microfiber cloths with little to no water may be the only option in order to preserve the patina. Regularly cleaning your instrument will ensure that lives a long, happy, and shiny life. In general, it is a good idea to treat your instrument with care as if it were a living thing. Like an expensive houseplant, your piano has specific climate needs and wants. Be careful to not expose it to adverse conditions and damage, and if you have to move it, please hire professional piano movers. If you attempt to move your piano without professional help, it is strongly encouraged to purchase rolling dollies from your local hardware store. You will certainly need several helpers, and no matter what, you will need more people than you think. As always, Songbirds Music, Art, & Dance Center staff are here to help and answer any questions that you might have. I hope that this article has helped and that you and your piano will enjoy many happy years of music making together.